Have you ever written down recipe ingredients on your shopping list, only to discover that once you get to the grocery store, they’re sold out of/don’t stock one of the main ingredients in the recipe? How annoying! Do you improvise with another ingredient, or do you decide not to make the recipe at all? Or do you go shopping at a different store, hoping they’ll have what you need? I had written down the ingredients in this recipe for dark chocolate cherry energy bites from Oh She Glows; I actually only needed to buy the dried cherries as I had everything else on hand. But when I got to the grocery store, I could not find dried cherries anywhere! Glace cherries, yes, but normal dried cherries were nowhere to be found. I decided to improvise with another ingredient – crystallized ginger. I really love the combination of chocolate and ginger, so I thought this would work. 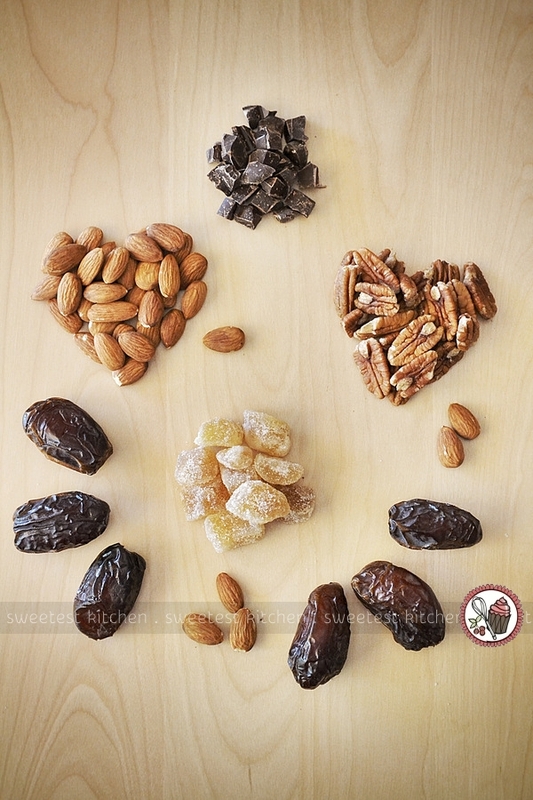 These are all the ingredients you’ll need to make this super easy and healthy on-the-go snack -chopped dark chocolate, almonds, pecans, crystallized ginger, and pitted medjool dates. A few whirls in the food processor will bind the ingredients together in a dense, chewy dough. You’ll get about 14 or 15 bites out of this recipe. I tasted the dough before I rolled it into balls, and with my first bite, I became disappointed because I didn’t taste any ginger. It was good, with a mellow chocolate flavor, but where was the ginger taste? After two or three more chomps on that sample bite, the kick from the ginger finally emerged and it was awesome. I fell in love immediately. You can adjust the amount of ginger to your liking; if you only want a hint, add less ginger, but if you love ginger and really want to taste it, add more. 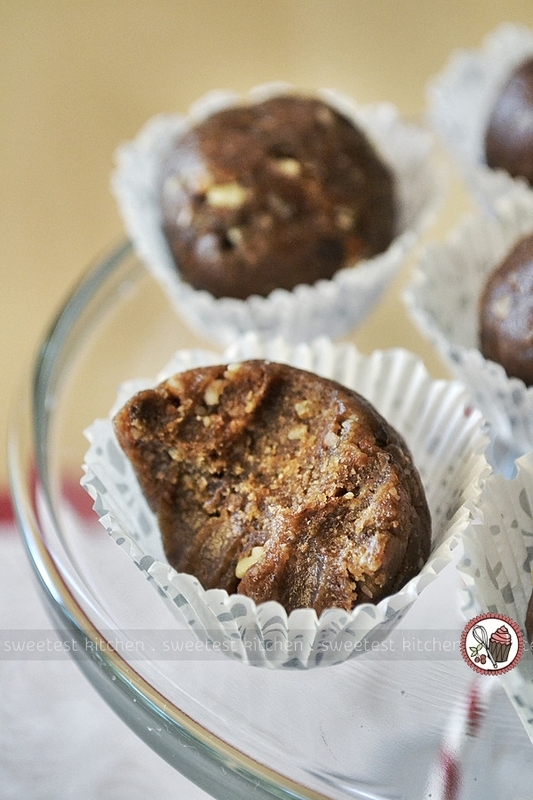 I can guarantee that if you love chocolate and ginger, you’ll love these little energy snacks! 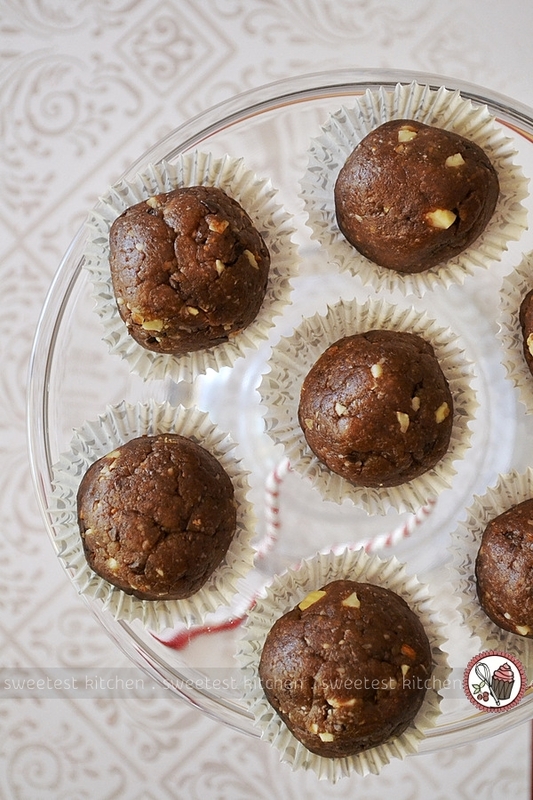 The combination of chocolate and ginger combine in these easy and healthy no-bake energy bites. In a food processor, process the almonds until finely chopped. Some larger chunks are okay, just be sure not to grind it into a flour so the bites will have some texture. Remove ⅓ cup of the processed almonds and set aside for the final step. Add the pitted dates to chopped almonds still in the food processor and process until finely chopped and sticky. A dough will start to form. Add ginger (add less at first, then taste and add more if you like) and process again until combined. The mixture will likely form into a large ball. If this happens, break it up with a spoon and process more if necessary. Add in the chocolate chunks, or chips, and pecans and process until chopped. Add salt to taste. Pulse in the reserved ⅓ cup almonds for texture. Roll into 15 small balls. Store in an airtight container in the refrigerator for up to 2 weeks. I love everything that you’ve put in here. I can’t wait to try the ginger taste too! I am making them tomorrow, so I’ll let you know how the kids and I like them. These are delicious! Thank you for sharing the recipe.